The History Center offers great ways for Boy Scouts to earn badges in Citizenship, Textile, Indian Lore, and American Cultures. Each spring and fall, the History Center offers a three-part series to facilitate Boy Scouts in earning their required Citizenship merit badge. Scouts can register for individual sessions or all three. Cost: Citizenship badge programs are $30 per Scout per workshop; the cost includes admission for one adult per Boy Scout. Boys who are 14 years old and younger must be accompanied by an adult. A nation is a patchwork of communities that differ from one another and may be governed differently. But regardless of how local communities differ, they all have one point in common: Good citizenship. In the United States, local government means self-government. Good citizens help to make decisions about their community through their elected local officials. Attend a local government board meeting. Our workshop includes a video of a meeting of the Orange County Board of County Commissioners. Some Scout leaders require attendance at a meeting in person, however. If needed, we’ll provide the information necessary to do so. Volunteer at a nonprofit organization. Develop a public presentation (such as a video, slide show, speech, digital presentation, or photo exhibit) about important and unique aspects of your community. Include information about the history, cultures, and ethnic groups of your community; its best features and popular places where people gather; and the challenges it faces. Stage your presentation in front of your merit badge counselor or group, such as your patrol or a class at school. Register here for the September 14, 2019 Citizenship in the Community workshop. *Counselors can sign off on prerequisites with valid proof of completion. Approval to sign off on prerequisites is at the discretion of the facilitating counselor. For more information or questions on how to satisfy the prerequisites prior to the workshop, please call the Education Department at 407-836-8580. As Scouts fulfill the requirements for this merit badge, they will learn how to become active citizens and be thankful for their liberties and rights. They will learn how to participate in their government, how to protect their freedom, and learn how to stand up for individual rights on behalf of all its citizens. Requirement 2: Visit a place that’s listed as a National Historic Landmark or listed on the National Register of Historic Places. Unfortunately, the History Center is not a historic landmark, however, the City of Orlando has six historic districts and 13 historic sites listed on the National Register of Historic Places. Several of the historic sites are located in downtown Orlando within walking distance of the History Center. Click here for a list of local historic places that can satisfy this prerequisite. Requirement 3: Watch the national evening news five days in a row or read the front page of a major newspaper five days in a row. Name your two senators and the member of Congress from your congressional district. Write a letter about a national issue and send it to one of these elected officials, sharing your view with him or her. Show your letter and any response you receive to your counselor. Register here for the October 12, 2019 Citizenship of the Nation workshop. Scouts who earn the Citizenship of the World merit badge will discover that they are already citizens of the world. How good a world citizen each person is depends on his willingness to understand and appreciate the values, traditions, and concerns of people in other countries. Register here for the November 9, 2019 Citizenship of the World workshop. Book an elective workshop that fits your troop’s schedule! 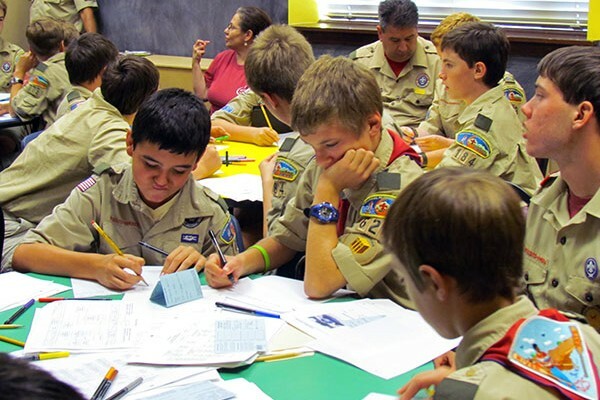 Choose one of our merit badge workshops, and we will help you complete the requirements with fun, hands-on activities. Cost: Elective badge programs are $13 per Scout per workshop; the cost includes admission for one adult per Boy Scout. Minimum of 10 Scouts required; maximum of 30 Scouts. Book your workshop a month in advance. A $50 deposit is required upon registration. To schedule a class, email Cynthia Tomerlin at Cynthia.Tomerlin@ocfl.net or call 407-836-8556. Boys who are 14 years old and younger must be accompanied by an adult. Far different from the stereotypes or common images that are portrayed on film, on television, and in many books and stories, American Indians have many different cultures, languages, religions, styles of dress, and ways of life. Learn about the different tribes that once lived in our state and take an exciting journey of discovery to meet some of Florida’s most fascinating peoples. Register here for the Saturday June 29, 2019 Indian Lore workshop. 10 a.m. – noon. The United States is a nation of immigrants. Every person came to America from somewhere else—or their ancestors did—and understanding these various cultural backgrounds can help Scouts to live in harmony with others in our varied and increasingly multicultural society. What do a Native American hut, an artificial heart, and a computer circuit board have in common? Textiles! Join us to find out what Florida’s early people used to forge homes and clothing. Put your hand to weaving, tying, and dyeing! Learn to identify natural fibers used by our ancestors. Let’s find out what types of fabrics were used through history and how they changed and contributed to history’s timeline. For more information and registration about History Center Boy Scout programs, contact Cynthia Tomerlin at Cynthia.Tomerlin@ocfl.net or call 407-836-8556.